The day after Thanksgiving is known as Black Friday. Online retailers fought back with Cyber Monday. Some local companies promote Small Business Saturday. It’s all about shopping. Even if you’re shopping for others, you’re still spending money –sometimes, money that you don’t have. Let’s take back our Thanksgiving weekends. Instead of rushing out after Thanksgiving dinner to wait in line for Black Friday deals, let’s spend time with family. Instead of elbowing our way through crowds or digging through sales bins, let’s be thankful for the gifts we already have. Instead of choosing cash, debit, or credit, let’s choose to give. You don’t have to follow the crowd to the mall; you can start your own Friday tradition. Make your own Green Friday (do something green), Red Friday (pay down credit card debt), or Purple Friday (do something creative), suggests Winona Dimeo-Ediger (there are more colorful ideas in her blog post “7 Colorful Alternatives to Black Friday“). 1. Turn off the TV and throw out the newspaper. Unless it’s something that you already intended to buy, holiday commercials and ads are trying to sell you something you probably don’t need, and may not even want once the novelty wears off. So ignore temptation. 2. Give back. Donate food, clothes, and household goods to a local charity. You will be able to clean up your pantry and closet, as well as appreciate all the things that you already have. 3. Clean up. On Sunday, December 1 at 8:30 am, join the Sierra Club to help clean-up Sandy Beach, Oahu. Meet at the eastern restroom. Wear closed-toe shoes and bring water and sunscreen. Bags and gloves will be provided. 4. Work it off. Work off the extra turkey, stuffing, gravy, and pumpkin pie. Go on a hike. Jog around the park. Swim at the beach. Paddleboard. Surf. Skateboard. On Thursday, November 28, you can join the 10-mile Turkey Trot with the Honolulu Marathon Clinic ($5 registration). On Saturday, November 30, you can hike Pu’u Ke’eke’ehia in Kula, Maui with the Maui Sierra Club (reservations required; donation requested); or take your dog on a hike along the Maunawili Ditch Trail in Waimanalo, Oahu with the Hawaiian Humane Society. On Sunday, December 1, you can hike the coastal sand-dune area of Maha`ulepu on the south shore of Kauai with the Kauai Sierra Club (donation requested); or run in the Silvia A. Martz Memorial 5K Run around Kapiolani Park in Waikiki ($15-$30 registration). 5. Get crafty. Encourage kids to make homemade cards and gifts for Christmas. Start a hobby that lets you make your own gifts, such as knitting, quilting, pottery, baking, or soap-making. On Friday, November 29, learn lau hala weaving or pua/haku lei making at Native Books/Nā Mea Hawai‘i in the Ward Warehouse in Honolulu (call Native Books at 596-8885 for details). On Saturday, November 30, learn the art of furoshiki (square fabric gift wrapping) with Evelyn Nakamura at the Manoa Public Library (RSVP required); or learn how to make a Xeric Holiday Wreath with Arthur Aiu at the Board of Water Supply’s Haleiwa Xeriscape Garden (call 748-5363; $5 registration). 6. Reach out. Call, write, or visit someone you’ve lost touch with. Whether it’s a relative, friend, neighbor, or teacher who inspired you, they will appreciate hearing from you. 7. Grow your garden. On Saturday, November 30, take a free “What’s Bugging You” workshop with Sharon’s Plants in Waimanalo, Oahu (RSVP required). On Sunday, December 1, go on a free aquaponics garden tour courtesy of Aquaponics Oahu in Aina Haina (RSVP required). Do you enjoy the Black Friday shopping frenzy? How do you spend Thanksgiving weekend? Has the way you spend the Thanksgiving weekend changed in the past years? I first heard about inquiry-based learning from Jessica Masterson, an English teacher at Aiea Intermediate School, who wrote an article about her rich experiences with Philosophy for Children – and the frustration and disillusionment of being forced to switch to the standards-based SpringBoard curriculum. My son is 7 years old, and we haven’t really discussed complex issues like fairness and goodness. But after reading about Philosophy for Children, I wondered if maybe he’s not too young to think about these things. When he read the junior novelization of “Despicable Me,” I jumped on the chance to ask him questions – not just about the characters and plot, but about philosophical themes in the book. I had a few ideas in mind: good vs. evil (Is Gru a villain? What makes someone good or evil? ), family (What makes a family? Do you need to be born into a family? Can you choose your family? ), priorities (What is Gru’s priority in life? Does his priority change? ), and truth (What is a lie? 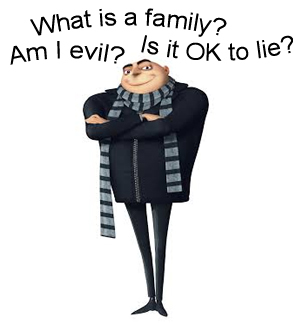 Does Gru lie in the book? Is it okay to lie?). Me: Is Gru a good guy or a bad guy? Boy: Good. Bad. Good and bad. Remember when he knew that he had to save the girls, so he did? Boy: Bad at the beginning, good at the end. Me: Why does he change? Boy: The girls… because he likes them and he wants to keep [sic] good care of them. They become a family. Boy: Yes. Family will be nice to you. Me: Is it good to have family? Boy: Yes, because your family won’t hurt you, they will help you. I could have taken it further, by asking: How does Gru treat the minions? Are the minions a family? When my son wrote his book report, he ended it with this: “Gru learned that if you have a family nobody will hurt you, only help you.” If I hadn’t taken a few minutes to ask him about the book, I think he would only have remembered the shrink ray gun, the minions, and the cookie bots. Do you think that philosophy should be taught to young children? Should we let young children enjoy movies like “Despicable Me” purely for entertainment, or should we ask them meaningful questions? A man held the door open for me. A cashier chatted excitedly with customers, giving them her attention. A man held my arm when I felt faint, and a woman gave me a cold drink. My son wrote thank you cards for people who gave him Box Tops for his school. November 13 is World Kindness Day. Tomorrow, and every day, let’s brighten someone’s day with small acts of kindness. Whether it’s a smile, a helping hand, or a simple thank you, we can help make the world a better place. 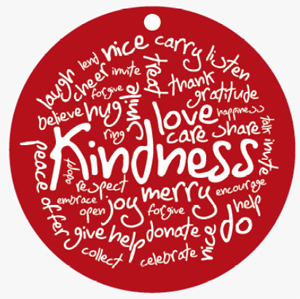 * Do an anonymous act of kindness – and leave a smile card behind. * Give a kindness card. Spread some nice around with a kindness note or thank you card. * Write an “Acts of Kindness” list. Instead of giving kids a list of rules, work with them to create their own list of ways they can be kind to each other. * Create a kindness banner. Hang a large banner at the front of the school, and invite students, teachers, and parents to share their kindness stories. * Start a kindness journal (or blog). Write down the kindnesses in your life – the ways you have been kind to people, and how others have been kind to you. You can even publish a book of kindnesses! * Take the “Be Kind Kid” pledge. Pledge to be encouraging, be supportive, be positive, be helpful, be honest, be considerate, be thankful, be responsible, be respectful, and be a friend. Sponsored by the Be Kind People Project, it’s a way to inspire classroom kindness. * Start a Random Acts of Kindness (RAK) Club. Be inspired to start (or join) a kindness-related student organization, and perform at least one random act of kindness each week. Share your kindnesses with others. Aesop wrote, “No act of kindness, however small, is ever wasted.” What acts of kindness brighten your day? What acts of kindness will you do to brighten someone else’s day? On October 29, Marilyn Travenner, the administrator of the Centers for Medicare and Medicaid Services, began her testimony before the House Ways and Means Committee with an apology: “I want to apologize to you that the website has not worked as well as it should.” Like everyone else, she had previously assured Congress and the nation that Healthcare.gov was ready to launch on October 1. I admire Travenner and Sebelius for their apologies, but I would like to call on more lawmakers and government leaders to take responsibility for both the government shutdown as well – and the promises that were made about the Healthcare Patient Protection and Affordable Care Act (HR 3590). Admitting your mistakes is part of the healing process for our country. It’s one way to regain some of the public’s respect. Here are just a few things I’d like to hear from our government leaders, with sincerity and humility. What could our government leaders say that would start to regain your trust? What would you like to hear from our president and elected representatives? With these words, in the first chapter titled “Red Nail Polish,” I was drawn into the life and words of elementary school teacher and poet Frances H. Kakugawa. They told me so much about her: that she has a sense of humor, a touch of rebellion, a desire for glamour, and a determination to make choices in her life. Despite these humorous observations, Kakugawa’s lifelong teaching started with her love of children and is strengthened by her love of words. She shares her experiences and insights about teaching in Hawaii and Michigan elementary schools, as well as the children and their writings that taught her to be a better teacher. She reveals that “A person who explores herself with turn her class room into one of exploration of new ventures and a safe place for learning” (page 4). Some of the memorable lessons for teachers (and parents): * Good teachers enjoy children. * Good teachers ask “How do students learn?” * Good teachers are honest with older students, acknowledging that sometimes students will not be treated equally (because of special needs or family situations). * Good teachers trust children to make decisions about their education. 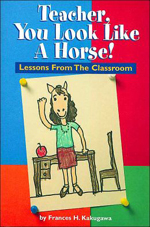 She cautions that a good lesson plan doesn’t guarantee learning – “Rather, it is the involved and interested interaction between our students and the lesson plans that makes for good learning, with the students taking lead” (page 10). Kakugawa was not afraid to acknowledge that sometimes teachers cannot treat every student the same. On the first day of school, she would tell her sixth grade students: “As your teacher, I have information about each of you which the rest of you don’t know about. Because of this information, there will be times when I will not be able to treat you equally and I will sometimes appear to have a teacher’s pet. I won’t be able to be fair all the time” (page 23). Throughout the book she reveals her love for children, reading, and words. For Kakugawa, poetry is like using words to help blind people see. It lets students explore feelings rather than ignoring them, and teachers should encourage them to write from their own experiences and feelings. Journals can create strong relationships between a teacher and students, if they write honestly and the teacher can offer privacy when the students need it. Kakugawa used journal writing to foster two kinds of relationships with her students: group relationships, in which she saw the students as a whole and developed mutual group respect; and individual relationships, in which she fostered personal, interactions and a respect for their privacy. Her writing is informal, sprinkled with short poems and journal conversations with students that tell us so much about her: that she loves children, that she is hopeful and generous, that she approaches teaching with honesty and fun, that she is open to the things that children can teach us. It was gratifying to read the words of students Kakugawa has inspired and kept in touch with over the years. And I loved Arthur T. Bear, who sat in the Author’s Chair in Kakugawa’s classroom, and inspired notes, stories, and poems, and even the Bearshop Estate condominium. Kakugawa reminds us all to notice the many magical, golden moments that happen between teacher and students (or parents and children), which might otherwise be ignored. “My wish for you is that you not only enjoy reading about these children but, best of all, come to the realization that if you will let it happen, ‘by the children you’ll be taught.’” You can find out more about Frances H. Kakugawa and read her blog at http://francesk.org. You are currently browsing the Better Hawaii weblog archives for November 2013.